Squirt is one of about 45 hydrants that have been adopted by residents of Brooklyn Park. If you drive north on Idaho Avenue North in Brooklyn Park, Minnesota, and go about a block past 71st Avenue, you will spot a red fire hydrant on the left side of the street. But it’s not just any ordinary fire hydrant. It’s Squirt, named by Brian, the man who adopted the hydrant using the city’s new online Adopt a Hydrant mapping app. Brian assumed responsibility for Squirt, promising the Brooklyn Park Fire Department that he would keep the hydrant clear of snow and ice during what’s likely to be a long, cold, snowy Minnesota winter. The agreement is informal and nonbinding—Brian could abandon Squirt with the click of a mouse or a tap on the Abandon me ☹ link. But city GIS coordinator John Nerge says that rarely happens in civic-minded Brooklyn Park unless someone moves. The red icons on the map represent the fire hydrants available to adopt in the city of Brooklyn Park. The city has about 3,500 hydrants. The online map, an HTML5 app built using Geocortex Essentials software from Esri partner Latitude Geographics, uses basemaps and transportation layers from ArcGIS Online and runs on Esri’s ArcGIS for Server. And the app is user-friendly. People just open the app in a web browser, type their home or work address in a search box, click Find Address, and the map automatically zooms to the location. 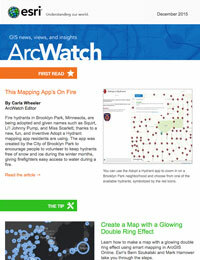 As users zoom out from the address, the hydrants available to adopt appear as red icons. Fire hydrant icons that are green have already been adopted, while those pending adoption are yellow. 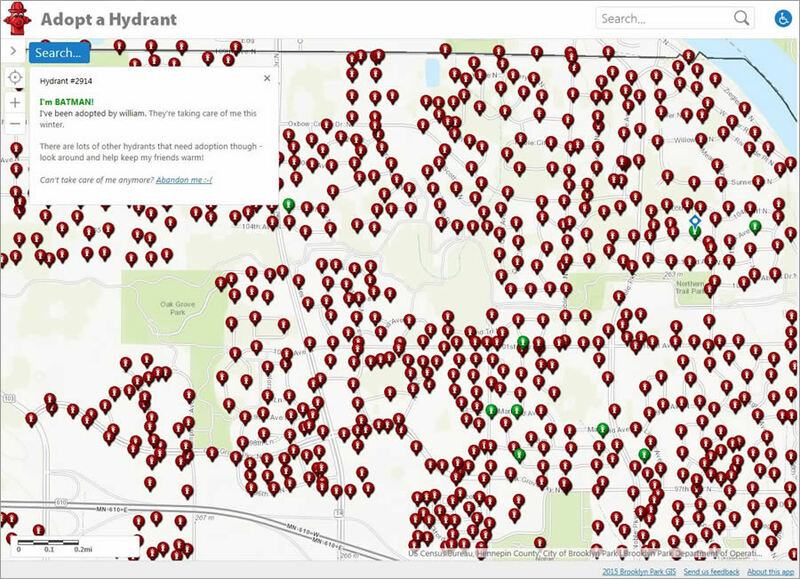 Each hydrant on the map has a number such as #737 or #2892, and pop-ups with a message that says, “Hi, I’m available for adoption,” and a blue link “Adopt me!” That link takes people to a form that asks for their name, email address, and a name for the hydrant. Each pop up includes the hydrant adopter's name and a warm message assuring people that there are plenty of other hydrants available to adopt in the city. Of the 3,500 hydrants in the city, about 45 have been adopted since the app’s launch last year, and that number is expected to climb this winter as a public awareness campaign goes into full swing. While the initial adoption numbers might seem like a drop in the bucket, even a budding program like this is valuable to firefighters, who depend on easy access to hydrants when fighting a fire. Hydrants covered by snow or surrounded by high snow-drifts or banks give firefighters a big headache, sending them scrambling—possibly in the dark—to clear a pathway to the hydrant and then shovel the snow off of it. Being able to easily access water quickly during a fire can be a matter of life and death, which is why developing a civic engagement app that encourages hydrant adoption was important. The city plans to build a mobile mapping app that includes the location of all the adopted hydrants, too, making it easier for firefighters to find the ones they know will be cleared of snow. “Extra seconds matter in saving a property or a life,” Nerge said. The app is very simple to use and was designed to be family friendly. Kaela Dickens, a GIS intern in Nerge’s office, built the app. She infused humor and used simple language in the text of the pop ups to appeal to parents with small children who might be interested in adopting a hydrant. 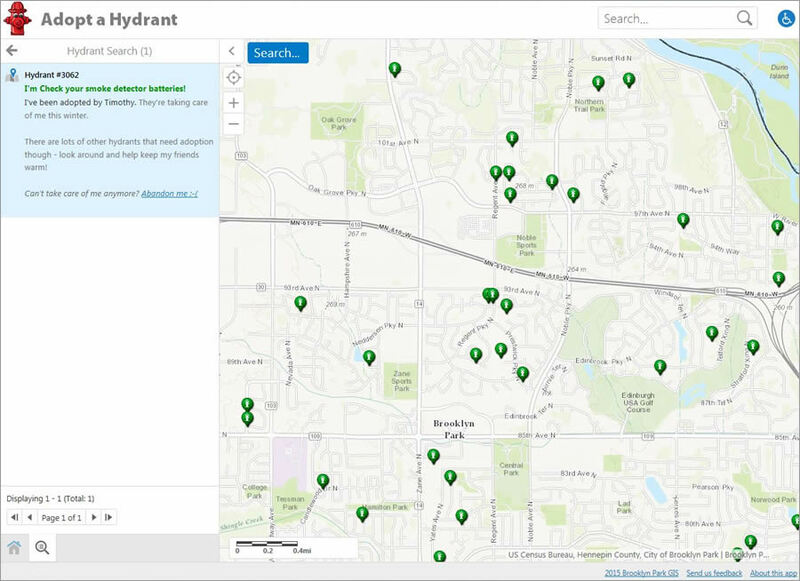 The forms for adopting (and abandoning) a hydrant were created using Geocortex Essentials software from Latitude Geographics. 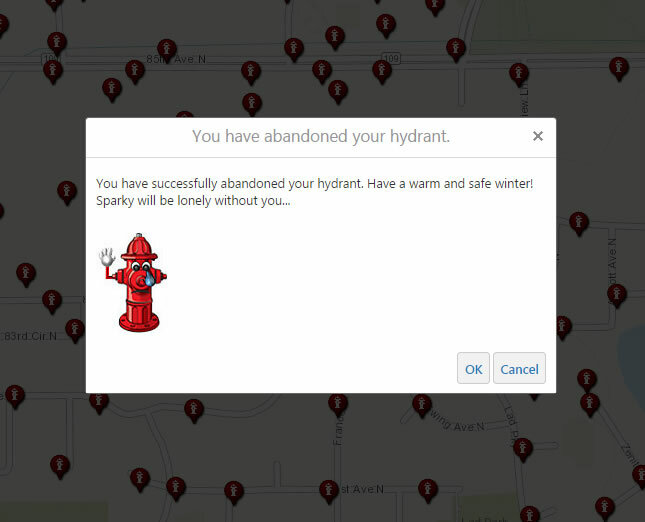 If Sparky the Hydrant is abandoned, Hoidal will receive an automatic message generated by the app: “You have successfully abandoned your hydrant. Have a warm and safe winter! Sparky will be lonely without you.” A caricature of Sparky is included, waving good-bye with a tear coming out of its eye. A user can abandon a hydrant such as Squirt by filling out this form. The City of Brooklyn Park’s Operations and Maintenance Department is tasked with clearing snow from the hydrants. But since it’s difficult to quickly remove snow from all 3,500 hydrants following a winter storm, fire officials depend on the public’s help. Firefighters will clear a hydrant if they arrive at the scene of a fire and need to hook up to water, but appreciate the public’s help, Pemberton said. The fire department recommends clearing a four- to six-foot wide path to the hydrant and a three- to five-foot radius around it. Even if a hydrant adopter must do the unthinkable, that person receives a friendly farewell message from its hydrant. Firefighters’ safety also is aided by the Adopt a Hydrant program. With safety in mind, Pemberton pursued the idea of an Adopt a Hydrant program for Brooklyn Park. 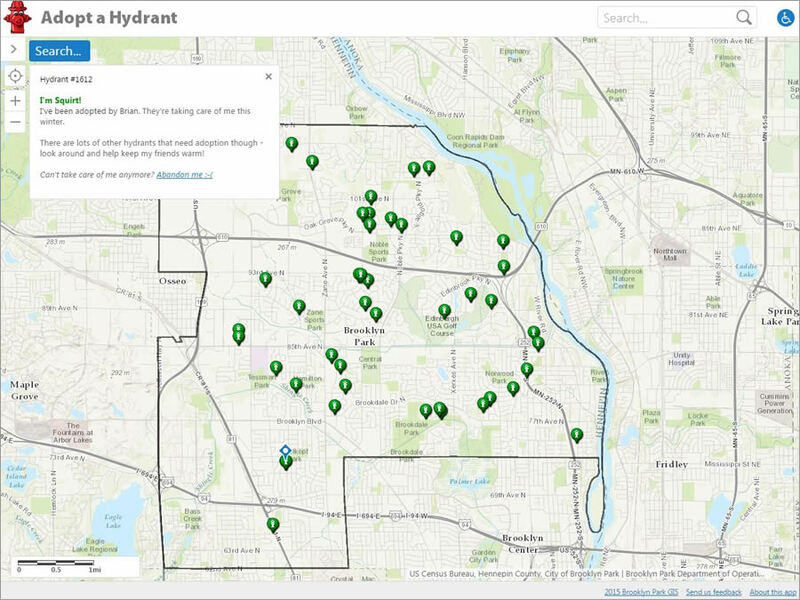 While other cities around the country have them, she thought hosting a mapping app would provide a great way to engage more people in the idea of personally caring for hydrants. “Some people are shoveling without officially adopting on the app, but we thought this was a new way to cause interest and engagement in a day and age of apps and tech,” Pemberton said. 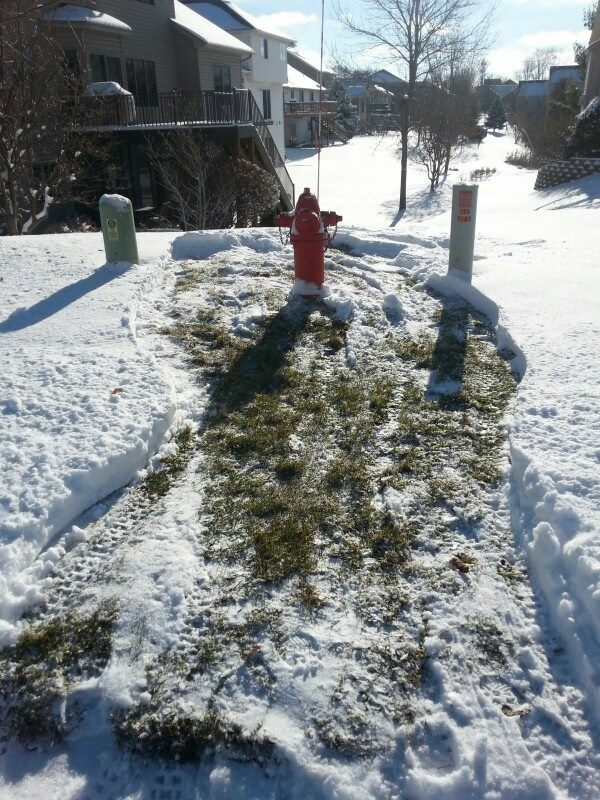 Spot the hydrant looks nice and clean after a snowfall in Minnesota, thanks to adopter Mark Frederick. Photo courtesy of Mark Frederick. When contacted by Pemberton, Nerge, (an unapologetic nondeveloper) said he decided to use the software and services he had available instead—GeoCortex Essentials and ArcGIS for Server. 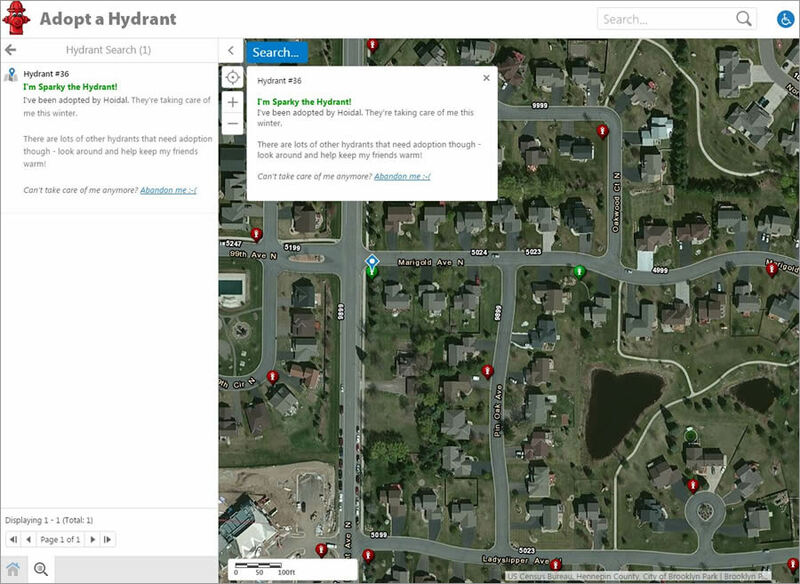 With Nerge supervising, Dickens used GeoCortex Essentials software to create the customer workflows, including the public-facing components: the text introducing the app to users; the address search box; the hydrant symbols; the adopted hydrant’s backstory including its name; other search tools to find and select a hydrant; the Adopt me! 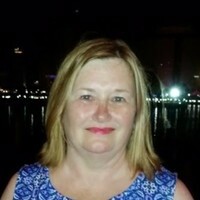 links; the form that collects people’s names, email addresses, and hydrant names; and everything else the user or administrator interacts with in the app. The city’s ArcGIS for Server hosts the hydrant layer, while ArcGIS Online provides the World Topographic Map and World Imagery basemaps and the transportation layers, Dickens said. The ArcGIS for Server service records and stores the adopter’s information. World Topographic Imagery provided by ArcGIS Online is used in the app. 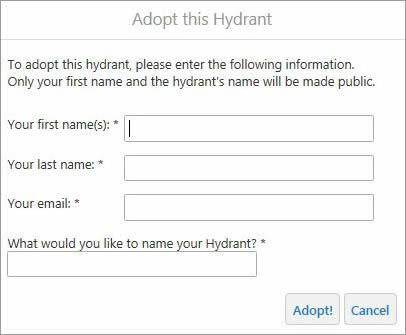 Pemberton uses an administrator version of the app to send out confirmation emails when adoptions have been approved (or rejected, if the proposed hydrant name is deemed racy or offensive). She also will notify hydrant adopters if snow is forecast for the Twin Cities, gently reminding people to remove snow from the hydrants soon afterward. She personalizes the messages, too, writing questions such as, How did Spot do in the snowstorm? or comments like, I hope Olaf is keeping warm. Adopt a Hydrant, one of the apps in the city’s gallery of 31 maps, offers a way for the city to communicate directly with residents. The staff hopes that, in the future, the app and others like it will help get people involved and in touch with city government and foster civic engagement, said Nerge and Dickens. “The motto at Brooklyn Park is, ‘We don’t do things to people. We want to do things with people,’ ” Dickens said. Bahr, the firefighter, heard about the Adopt a Hydrant app through an email from the city. So he adopted the hydrant near his house and named it Check the Fire Detector Batteries. “To me, [working smoke detectors are] just as important as keeping the hydrants clear,” Bahr said. Firefighter Timothy Bahr's adopted hydrant, Check your Smoke Detector Batteries, sends an important message about fire safety. 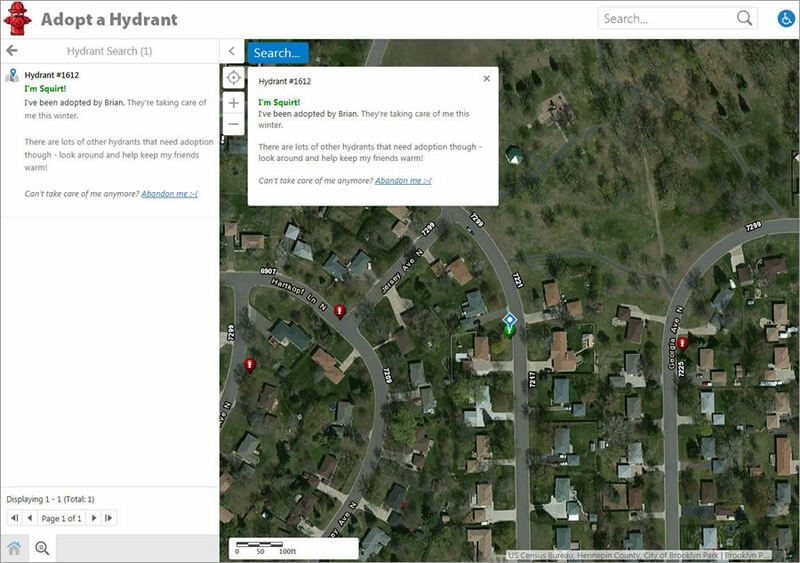 The City of Brooklyn Park won a Special Achievement in GIS Award at the 2015 Esri User Conference for its innovative use of and best practices for using the Esri ArcGIS platform. In just three years, the city went from posting nine PDF maps to hosting 31 mapping apps on its website. The map gallery, managed and hosted in ArcGIS Online, includes a time animation app of traffic accidents; a voting information app; and Story Map Tour of the winning gardens in the Summer Blossom program which encourages beautifying the city through landscaping.